I hate shoe shopping. Not because I don’t like shoes. Oh no, I love shoes. Somewhere deep down is side of me, there’s a girl who could own a closet full of shoes and still keep on buying them. But I don’t. Because I hate shoe shopping. I’ll let you guys in on a little secret: one of my feet is bigger than the other. The left one to be exact. Not a little bit bigger, that wouldn’t have been a problem. Nope, it’s one size bigger. One freaking complete size bigger. Do you now understand why I hate shoe shopping? There’s no way that I’m actually going to buy two pairs of shoes, so I always have to go through hell trying to find a new pair. It’s already difficult enough to find a pair that I fit, let alone a pair I actually like. So many times I’ve found the perfect, cutest shoes, only to find out that (of course) I don’t fit them. Low heeled boots and jogging shoes are (relatively) the easiest; try to fit the larger foot in and it doesn’t really matter if the other shoe feels a bit loose (an extra sole can easily fix that). But high heeled boots, pumps or sling backs? They’re terrible (but way prettier; so of course I’m going to go through the trouble to get them). I always have to go for the pair that isn’t too loose on the small foot (cause otherwise it falls off) and isn’t too tight on the big foot. Sigh… why can’t I buy two different sized shoes? Well, I found out today, some places you can. 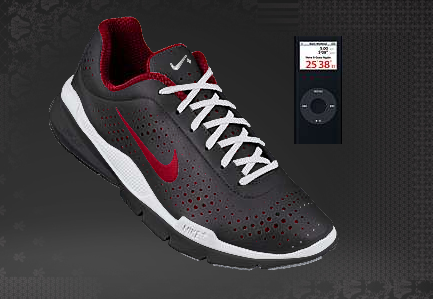 I was looking for new running shoes (because I started exercising again) and took a look at the iPod Nike ones. You know the ones with a special sensor you can put in the shoe to measure how fast you’re going? Turns out, you can customize them, pick your own colours and stuff like that and you can specify the size of each of the shoes. Great! They’re a bit pricey, but I do think that in this case for me it might be worth it. Now all I have to do is pick the colours I want!